Let's HOP right into letter Hh! Letter Hunt: Your letter bucket is filled with a toy horse, house, helicopter, hippo, hog, hamburger, hat, etc. 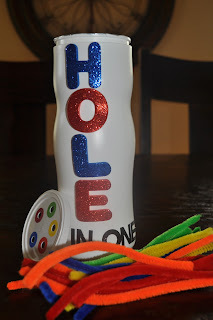 Fine Motor: a "HOLE" lot of fun! Use an old puffs container, or something similar, and punch holes in the lid. Decorate it however you wish! Place hole reinforcers around the holes, and color with markers. Place the lid on, and have your smartypants put the matching color of stem into the corresponding hole. Books: Below are a few suggested readings for your little ones. You should be able to find most of these books at your local library or around the house. One of our favorite things to do is use sidewalk chalk to make HOPSCOTCH. It's a great activity to incorporate the letter "Hh", and includes number recognition, gross motor development, and, of course, PATIENCE, as you wait your turn to HOP! Have some fun at the end of the week, and have a "Happy Hair Day". Let your smartypants get creative with their hair! Hope you had a hopping good time!